Metering Pumps are designed to deliver a precise amount of liquid over a wide range of pressures, in a set period of time. They are available in both reciprocating piston and diaphragm designs. 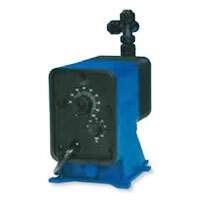 Metering Pumps are available in a broad range of corrosive resistant materials of construction. Flows range from 3 GPD (Gal. Per Day) to 370 GPH ( Gal. Per Hour) with heads to 1000 PSI. Use for these applications: Chemical Dispensing, Injection, Metering, Photo Processing, Plating, Process, Water Treatment.